Over the years, medical marijuana patients in San Diego have endured a lack of representation in local governments, raids, lawsuits, eradication efforts, federal interference, and outright misinformation about the issue. Fortunately, now we have a new Mayor who sides with compassion instead of ignorance and is willing to move forward with regulations. After attending the January San Diego Americans for Safe Access Meeting, where he promised to move forward with regulations, Mayor Bob Filner began working on a proposal to bring to council. Friday, the Mayor’s office announced his proposal is finished and the issue tentatively scheduled for the March 25th City Council meeting. The full draft of the ordinance however won’t be publicly available on the city’s website until Wednesday, March, 20th. Although the complete ordinance is not yet public, today the Mayors office released the executive summary that will be presented to council, the list of proposed permissible zones where collectives and cooperatives could operate, as well as a map of those zones. In addition, we learned there is a possibility the item might be continued to a later date in light of a more urgent city issue. We should know with certainty whether the item will be hear on the 25th of March by Wednesday, March 20. Whether its on the 25th or another day, we need patients and supporters to come out to city hall, sign in to speak, and tell your stories. Help us urge city council to move forward with sensible regulations without delay and establish permanent safe access once and for all in the city. The issue of whether the medical marijuana dispensaries should be permitted to operate within the City began in earnest with the establishment of the Medical Marijuana Task Force (MMTF) in October 2009. The MMTF was established to advise the City Council on guidelines for patients and primary caregivers, the structure and operation of cooperatives, and police enforcement. On November 12, 2009, the MMTF issued its recommendations. On March 28, 2011, the City Council adopted an ordinance establishing medical marijuana consumer cooperatives as a permitted use in the CR-2-1 commercial zone and the IL-1-3 and IS-1-1 industrial zones subject to restrictions. In general, there were two reactions to the ordinance. The first was that the ordinance was too restrictive in allowing medical marijuana dispensaries in such a limited number of zones and, second, that an ordinance allowing medical marijuana dispensaries should not have been approved. As a result of the first reaction – that the limited zones with an expansive number of buffer areas protecting “Sensitive Receptors” created a virtual ban on dispensaries anywhere — a petition to place the matter on the ballot was circulated and received enough signatures to require the City Council to either place the item on the ballot or to repeal the ordinance. On September 27, 2011, the City Council voted to repeal the ordinance. On January 28, 2013, the Mayor committed to the City Council that he would bring forward a new draft ordinance for the Council’s consideration within 30 days, and that the new draft would be based on the ordinance the Council passed previously. To allow patients in need with a proper prescription access for the compassionate use of medical marijuana throughout San Diego. To allow limited competition in permissible zones so that patients can find the strain they need to alleviate their symptoms and to improve the quality of their lives. To prevent dispensaries from encroaching on our residential neighborhoods. To protect children from unprescribed use. The “medical marijuana consumer cooperative” has been renamed “medical marijuana dispensary” and the definition modified. The permit requirement has been changed from a Conditional Use Permit (CUP) Process Four to a Neighborhood Development Permit (NDP) Process Two. The number of zones where a medical marijuana dispensary may be permitted has been expanded to include all of the Community Commercial (CC) zones. The distance separation requirements from churches, libraries, and youth serving facilities have been deleted, and for purposes of §141.0614 (Medical Marijuana Dispensaries) “school” has been defined consistent with California Health and Safety Code Section 11362,768(h). The regulations state that a medical marijuana dispensary may not be located on a premises that includes any residential use. 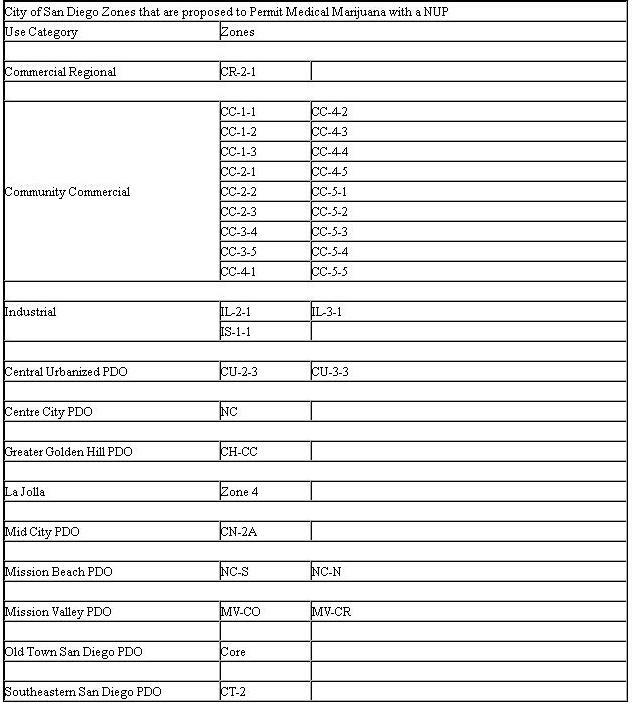 The Planned District Ordinance (PDO) zones that may permit medical marijuana dispensaries are now specified in PDOs that have specialized commercial zoning. Section 151.0103 has been modified to reflect the current Municipal Code section which was amended subsequent to the March 2011 hearing. 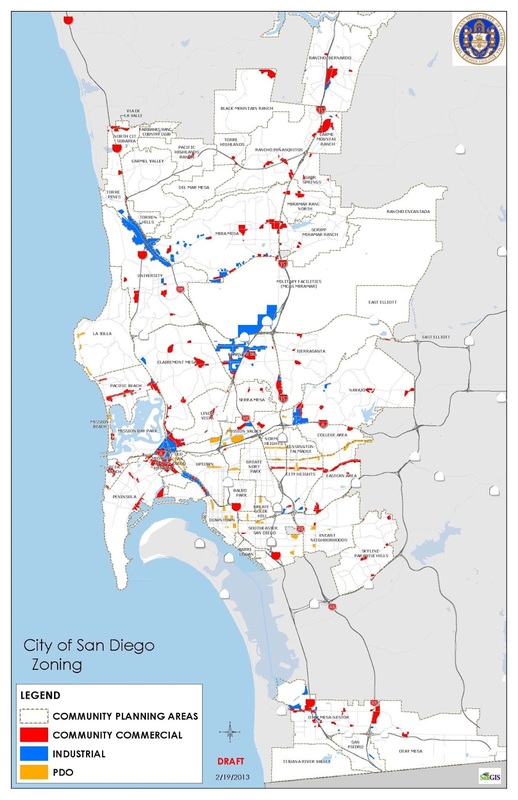 (3) prohibit the siting and location of medical marijuana vending machines in the City of San Diego. « State Public Utilities Commission to vote today – March 21 – on SDG&E’s $1.5 billion power plant scheme. I detest the whole public safety aspect of this debate. There are more issues living near liquor and convenience stores, gas stations, banks and pharmacies than MJ dispensaries. Yet it is the dispensaries that have to jump through hoops. Ridiculous! Hopefully in 2016 it’ll be legal for recreational use and the whole issue will be moot. That’s true Brent. When was the last time you’ve heard of a stoner beating the *#$&*( out of his wife and kids?